Once in a while, in life you have these Ah Ha moments where you need to stop and just take something in for a bit. I had one of these last week on a gorgeous spring day at the Virginia Living Museum in Newport News, Virginia. It’s less than an hour’s drive from either Williamsburg or Virginia Beach. Stay with me here and I’ll get to that Ah Ha moment. But first, let me tell you about all the cool stuff the museum has to offer. The cool thing about this museum is that you are not limited to indoor exhibits. We walked along an outdoor trail which is really more like a preserve meets a zoo. It’s a 3/4 mile long boardwalk that features Virginia’s wetlands and the animals that inhabit them. It’s long enough to get a lot in but short enough that it doesn’t become “theme park unbearable” with little ones. We went with friends who have small children, and it really was quite enjoyable for them. Our welcome on the trail was a very distinctive odor that was quite unpleasant. I later learned that it was a skunk. Now I know what that smell is and I hope I never have to pull it up from my memory banks again. 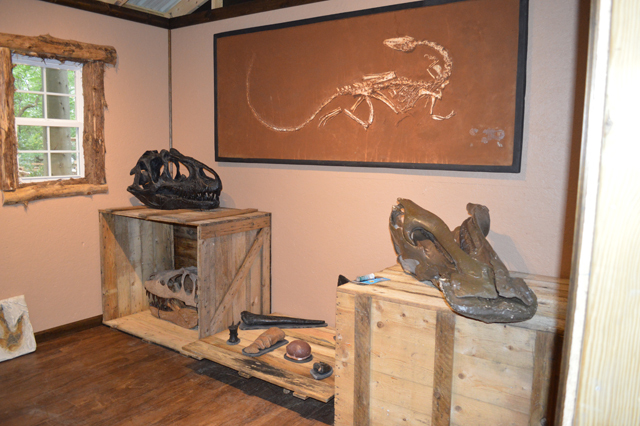 The museum features over 250 species all found in Virginia. We got to see red wolves which are the most endangered animal in North America. We also saw two gorgeous bald eagles, deer, bobcats and quite a few other wild animals. The kids all really dug the beaver display. I liked it too until the moment he squatted into a weird position, lifted his tail and pooped right in front of me. That was special. Towards the middle of the boardwalk we encountered the Dinosaur Discovery Trail where we saw replicas of some of the dinosaurs that inhabited the earth millions of years ago from the Jurassic and Cretaceous eras. We saw the Velociraptor, Tyrannosaurus rex and Stegosaurus to name a few. The teenybopper and I had a great time reading up on all of the dinosaurs and checking out the replicas of fossils that are on display at some of our US museums. These were housed in Discovery Huts. What I really liked about this exhibit was that we were able to get very close to and interact with replicas of the remains of these dinosaurs that they would not be able to get so close to in a big fancy museum. I love me some MOMA and Museum of Natural History and the like. But especially when kids are young, touching is a big part of learning. Soon after we were done viewing the animal exhibits, we came to the Coastal Plain Aviary. There were ducks, egrets, herons, and many more coastal birds. We actually went into the treetops over Deer Park Lake into the aviary. It was pretty darned cool. 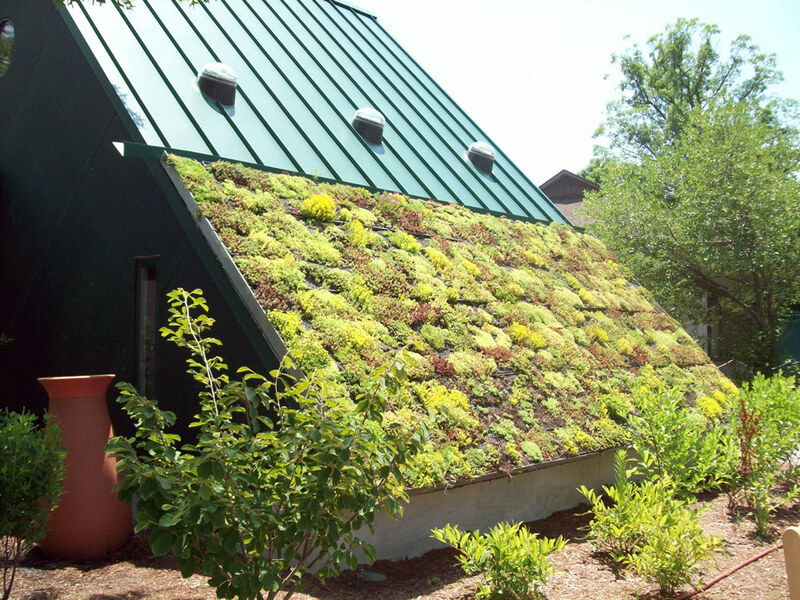 During our trek we happened upon house with a living green roof and solar panels. The 600 square foot house is packed with examples of materials that can be used to build an earth-friendly home. Aside from more interactive fun like a solar fountain that the kids can manipulate, there were solar panels, passive solar heating, a solar water heater. Well you get the drift. There were alternative wall systems, insulation, geothermal heating and cooling, salvaged lumber and so on. Let’s just say this environmentally conscious mami started feeling like a total slacker in that department. On the other hand, I got some great ideas for projects! There were several gardens including a Virginia garden that showcased 400 years of local species including the plants that were here when settlers landed in Jamestown. There is also information about the plants that have been introduced that are invasive and pose a threat to the local species. The kids shrieked with delight as we arrived at the Children’s Garden. What was so special? 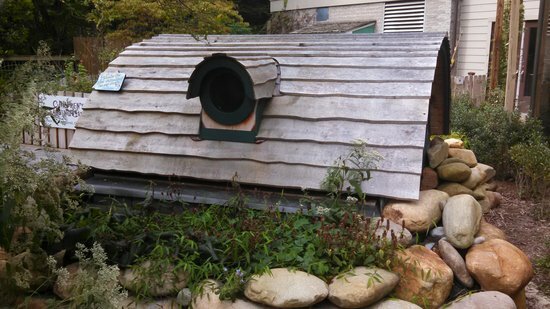 There was a playground for the littles, but there was also what looked like a hobbit home. They all tried to pack into the hobbit house and the teens ended up having a hard time getting out which brought on fits of giggles from children and parents alike. My favorite exhibit was the Wolf to Woof: The Story of Dogs exhibit which showcased the history of the canine. Even the teenybopper enjoyed learning all about how wolves evolved into the docile and loving domesticated pets we enjoy today. 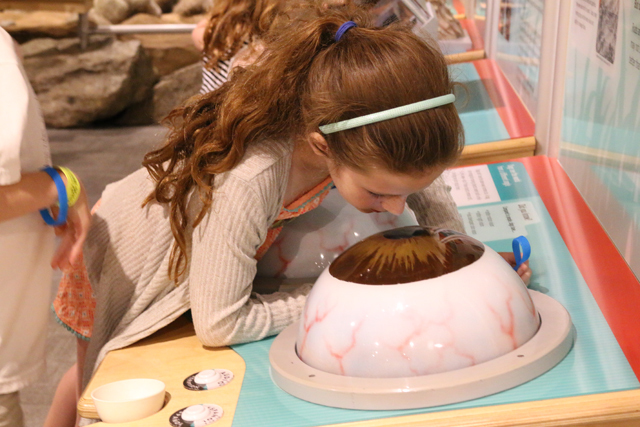 The exhibit featured dioramas, displays and plenty of interactive stations including one where you would look into a replica of a dog’s eye and see the difference between how they see and how we humans see. Yes, it’s true. Dogs only see in yellow and blue. But, they have amazing night vision and can see farther. We learned so much about dogs throughout history and throughout the evolution that it was quite the information overload but this geek loves information so no issues here. Back to that Ah Ha moment. As I was approaching the end of the Wolf to Woof exhibit there was one display that was detailing how scientists started to find dogs buried with their owners during excavations. Based on these findings, the theory is that dogs were buried with their humans as far back as 14,000 years. As I was standing in front of exhibit reading the text and mulling over what I was learning, one of the volunteers at the museum, an older gentleman came forward. He smiled and said “Well here’s a thought. Have you noticed there’s not one mention of a dog in the Bible?” I paused and he paused waiting for my reaction. I didn’t react as I was still mulling it over. I thought, that can’t be right. Of course my curiosity was piqued. I can’t say I am the most well learned scholar when it comes to the Bible. I read it as a child in study and then again as an adult, but I’m not the type who can quote scripture off the cuff well. So I did what any curious person in 2017 would do. I went to Google. So after researching a bit, I did find that dogs were mentioned in about 25+ verses. There may be more, don’t quote me. All of the mentions were negative, so my assumption is that the gentleman I spoke with was referring to domesticated dogs. Here’s a great article that breaks it down incredibly well. So, really, my Ah Ha moment was not the revelation about domesticated dogs not being in the Bible. It was that I learned some really cool stuff about history, heard some information I wasn’t too sure about and researched it to further to educate myself. I could certainly have taken what he told me and started to tell everyone about it, and I eventually would have run into someone who would set me straight. I also could have erroneously let my kid think the same thing. It took five minutes for me to become less ignorant about a topic. What are your favorite Ah Ha moments? Going to the museum always brings up a lot of ah-ha moments for us and the boys. There’s always something to learn. Ali, I was totally geeking out over that roof. OMG! That Living Museum seems amazing! Definitely going there someday 🙂 . My last Ah Ha moment was reading a book that has a movie based in it, because it explained a lot more that what I got from the movie… I know it’s like that most of the time, but this one was fundamental information that I had asked myself why and even google couldn’t give me the whole context I wanted! What a lovely place to take your kids as there appears to be something for everyone. It’s hard when your kids have different interests so I liked how varied the exhibits were at this museum. That sounds like such a great museum!!! I would love to take my kids there!!! What a great place for learning. My boys would have liked the pooping beaver. That’s why I love visiting museums and spending time with nature, it gives you a chance to reflect. It’s always fun learning new things! We’ve had several of those AHA moments ourselves as a family! Thanks for this info! Sounds like a great place and I just had family move near Newport News, so hopefully we can check it out soon. WOW what an amazing place to visit. I bet the kids loved it! The dog question got me too! I was raised in church and when I read the question, my mind completely went blank. I love going places or even reading things that make me have those “aha” moments. Thanks for sharing. I know that this place is supposed to be for kids, but it looks very entertaining! It looks like such a fun and different way to learn about natural history and biology. I love the video of the bald eagle by the way! It is an amazing place to visit especially with kids. Virginia Living Museum is on my ‘to visit’ list right know, as soon as I get back to the States. This is very cool! I think it’s awesome to be able to visit museums especially in places like Virginia! They have so much to offer for the kids. It’s going to be a great learning experience. This is such an interesting place. I love those eagles! Can’t wait to visit on my next trip on November. What a cool place to go for families, fun times and learning! This is an interesting post. I’ve always love visiting new places! What a great place! This place looks like the kind of place I would love to go with my family. Anyway, I’m pretty sure I remember dogs being mentioned in the Bible. I need to look this up to find the specific verses, but I can bet money that they’re in there somewhere! I wanted to move into the hobbit home too 😉 But after seeing the teens get stuck, I decided to use my adult senses. Shauna, I was hoping you’d chime in! Isn’t that a bizarre thing? This looks like a blast. That Bald Eagle is gorgeous! Nice museum and looks like a lovely place to visit. Any place with a bald eagle is a place I’m happy to visit. Looks like a lot of fun! I love taking my kids to discovery museum. It’s more fun and they get to explore and learn new things. I would love to bring my family to visit this place if we’re in Virginia. This is my kind of Museum. I love that they have outdoor exhibits. I will have to check it out the next time I am in the area. I had never considered that there weren’t any domesticated dogs in the bible! How bizarre! This looks like a fun place to visit! This looks amazing! My sister lives in Virginia, I’m forwarding this to her so she can check it out! This sounds and looks like a really great day out for the family! A playground is always handy with kids! I love museums. I can spend an entire day just going through all the displays. I like the concept of a living museum. I’ll have to put this on my bucket list when I visit Virginia. This looks so cool and educational! I think adults and kids would enjoy themselves here! Amazing museum! Kids will love to visit here and discover more of about our planets and the other living things! I lived in Virginia as a young child, and I’m going back next year to visit family. I’ll have to look for this museum! I have never been to a living museum! This would be an awesome experience for me and my kids! They are all over the country and they are awesome. Wow Danay! What an Ah Ha moment. This is sooo interesting! Oh, I love the gardens and greens. So darn pretty! I would totally visit.